Spring is finally on its way, and that means it’s time to get prepared for the warmer weather. If you’re anything like most people, the warmer temperatures are always welcome, as is the excitement of planting and other outdoor activities. One thing you may not realize is that this is also the best time of year for termites to enter your home. Let’s dig a little deeper into this, shall we? Even though termites are generally active year round, like most other pests, spring is when they do a considerable amount of multiplying. This means that existing colonies will grow exponentially, and that leads to swarmers. Swarmers are male and female termites that are known as “reproductives”, and they are the only ones in the colony that have wings. When the warmer temperatures of spring arrive, the swarmers leave the colony and look for a mate. When a male responds to the female pheromones, the pair breaks off their wings. This means that they are mates, and are now on the lookout for prime nesting location, and this is often in your home. Once the pests take up residence, they begin building their nest and mating. This initial pair starts populating the colony, and within three or four years, another group of swarmers will take flight. If you are seeing winged termites around your home, or even seeing groups of them flying, you may already have a problem on your hands. These swarmers take quite some time to develop in a colony, and they only do so when the colony has gotten too large after all that spring mating. If you’ve got these pests around your home, there is a good likelihood that your home is already infested. It can take some species of termites several years to produce a colony that causes noticeable damage to your home. That’s why it is so important to have an inspection done in the spring each year. After the colder temperatures and release of the swarmers, there are plenty of termites on the prowl for a tasty piece of wood to call home. Another important reason for springtime inspections is the wet weather. The rains that abound during the early part of spring make the wood of your home damp, and this means it’s also softer. 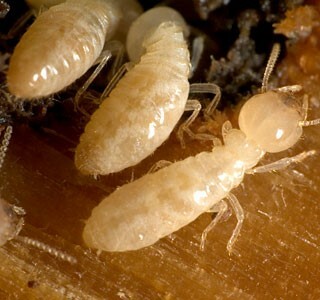 For termites, soft, damp wood is a dream come true, and they will love every tiny bite as they create areas that are perfect for laying eggs. Many people enjoy the toasty feel of a wood-burning fireplace during the colder months, and if that woodpile is near your home, you could be creating the perfect chance for the pesky critters to enter your home. Even if you don’t carry the termites into your home with the wood, the close proximity to your house provides the perfect opportunity for them to make the trek when spring’s warmer temps hit. Many people begin planting flowers and laying down mulch in the spring as well. If you aren’t careful about leaving plenty of space between your foundation and the mulch (around six inches), you are creating a great way for termites to burrow. You also have to take care not lay the mulch too thick, as anything over four inches provides the perfect combination of dampness and coolness to keep the pests happy as well. Spring is the best time for a termite inspection because you will be able to determine whether any have decided that your home will make a great place for a colony. If you continue to have an inspection every spring, you will ensure that potential problems are caught before they can do extensive damage. Sugarland Exterminating brings years of termite experience to the Acadiana, so contact us today for a free estimate!